Tomorrow is three months since Jeremy Corbyn became leader of the Labour Party. Shortly after he took over I produced a chart showing how Labour’s poll score has changed over the first year of previous leaders (data from Mark Pack’s brilliant collection of all post-war voting-intent polls). I found broadly three categories: for some leaders (Kinnock, Smith, Blair) the score increased sharply in the first three months, then slowly decreased over the next nine months; for some leaders (Gaitskell, Wilson, Miliband) the score increased a little then stayed flat for the rest of the year; and for a couple of unfortunates (Callaghan, Foot), the score fell in the first three months then continued to fall for the rest of the year (Brown was an exception in that his score rose quickly at first then fell faster over his second three months than any previous leader’s). 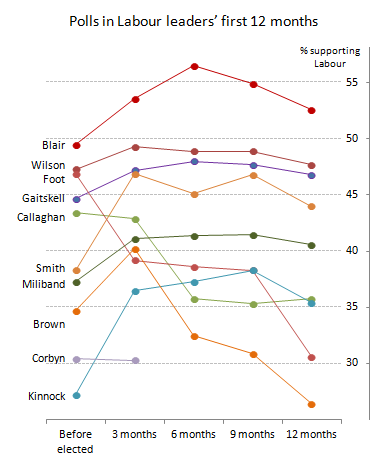 I also noted that every Labour leader who started with support below 40% immediately increased it by several points. Note on methodology: I’ve recalculated all the scores with a more consistent way of selecting the polls and accounting for agencies that produced multiple polls in the period. This has changed some scores, but only slightly, and broadly in ways that make Corbyn’s polls look better than they did under the previous calculations. To be consistent I should include Labour polls over the next two weeks (and will in the six-month update); there were only three polls in the Corbyn three-month data (all drawn from UK Polling Report), so it’s susceptible to change if more are published shortly. This entry was posted on Friday, December 11th, 2015 at 08:15	and is filed under Labour leadership, Politics. You can follow any responses to this entry through the RSS 2.0 feed. Both comments and pings are currently closed.